One of my early memories of birds is the abundance of Ospreys I saw after moving from Syracuse, New York downstate to eastern Long Island at the age of eight. I know that Ospreys nest in upstate central New York, but if I saw them there as a child, I don’t recall it (though my father will probably remind me that we did). But “fish hawks” were impossible to ignore on Long Island, conspicuously perched atop their roadside nesting platforms high above the coastal saltmarshes and brackish cattail stands of Suffolk County, and – most importantly – easily spotted from the car. When I resumed birding on my own in my late 20s in Queens, I always looked forward to seeing the several pairs of Ospreys nesting at Jamaica Bay Wildlife Refuge, a sight made all the more welcome after I learned of their drastic decline in the 1950s and ’60s due to the use of the insecticide DDT, followed by a remarkable population recovery. Ospreys nesting on platforms like this one in Fort Ticonderoga, New York make easy targets for even the most modestly-skilled bird photographers (this author included). Though we sometimes grapple with ambiguous depictions of birds here at Birds and Booze, there’s no doubt about the feathered star of this week’s featured beer: in a delightful rendering by New Jersey-based artist Spring Whitaker, an Osprey flashes its cruelly-hooked bill and piercing yellow eyes, ominously framed by this bird’s dark, trademark bandit’s mask – even as the fearsome demeanor of this predator is tempered slightly by a whimsical crown of plants in a juxtaposition with Arcimboldo-esque overtones. 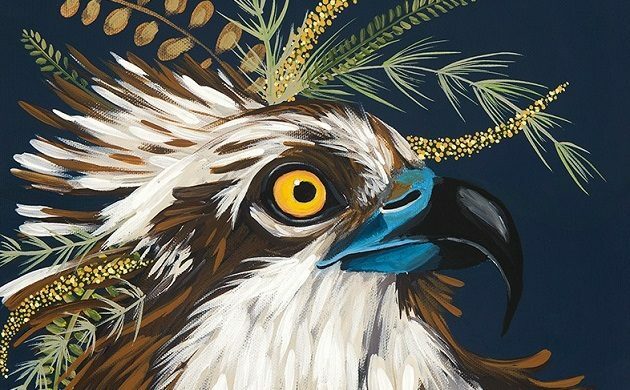 Whitaker’s beautifully-composed example of avian portraiture – the like of which we see all too rarely on beer cans – was commissioned for Osprey’s Fresh Catch, a new India pale ale from Horus Aged Ales of Oceanside, California. A close-up of Spring Whitaker’s remarkable can art. There isn’t much in the way of “official” information about Horus Aged Ales, a brewery founded in 2015 by an ambitious homebrewer named Kyle Harrop, who still works by day as an accountant in the aerospace industry. Horus is named for the falcon-headed god of ancient Egyptian mythology, a sobriquet chosen in honor of Harrop’s father, an avid falconer. Raptors were also the inspiration for the Horus brand logo created by the design studio Moon Collective, which shows the bearded Harrop in profile wearing a feather headdress topped with a falcon’s head, an image with obvious allusions to the eagle warriors (cuauhtli) of the Aztecs. If this choice comes across as a bit vain, it’s important to note that not only is Horus ostensibly a one-man operation, but even more incredibly, it’s also a brewery without a brewhouse. As its founder and sole employee, Harrop keeps his part-time brewery afloat with a grueling schedule of one-off partnerships with high-profile craft brewer that have brick-and-mortar operations of their own. Needless to say, this lack of a brewhouse resigns the brewer to a peripatetic existence and Harrop completed an astonishing 55 collaborations on the road in 2017. Due to low production volumes, many of these beers were highly sought-after by bottle collectors, with some selling out in a matter of seconds! What relatively modest capital Horus does possess is limited to a small barrel house back home in Oceanside, where Harrop blends and ages beers in dozens of oak barrels that formerly held a various wines and spirits. Early declarations by Horus outlined a complete devotion to barrel-aged beers (in particular, sweet, so-called “pastry stouts” and spontaneously-fermented sour ales), so it’s unclear where Osprey’s Fresh Catch fits in with the rest of the Horus portfolio. Brewed under contract by Octopi Brewing of Waunakee, Wisconsin according to Harrop’s recipe, Osprey’s Fresh Catch is a IPA, roughly in the trendy New England style, brewed and released – as its name suggests – without the intervention of barrel aging. It’s a bit of a departure from the brewery’s earlier releases and its original mission statement, but it’s a delicious beer nonetheless. Osprey’s Fresh Catch is an IPA, on the stronger side at 7% alcohol by volume, and triple dry-hopped with the Citra, Mosaic, and Simcoe varieties. Aside from its valuable aromatic contribution, all that hopping seems to have lent a slight greenish tinge to the beer, which is otherwise a hazy, pale amber in the glass. The impressive bouquet starts with passionfruit and pineapple in equal measure, followed by a resiny mix of pine and mango, and a sweet and bright dose of tangerine and grapefruit. A soft, almost fluffy mouthfeel delivers more pulpy, tropical flavors in the form of passionfruit, mango, and oranges in syrup, backed with a subtle touch of cracker-like malt. This cool and refreshing mix of sherbet fruit flavors is tempered with a slightly chalky minerality in the finish, giving Osprey’s Fresh Catch the feel of a spritzy orange soda, with a bit of citrus bitterness in the end. 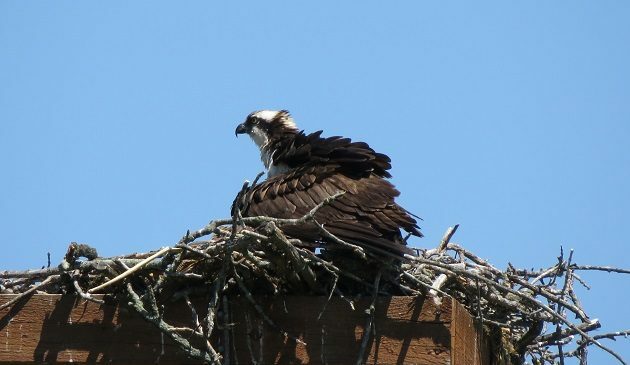 Just a fun brewing fact for the end: while I don’t think a fish-eating Osprey had anything to do with the hop harvest that went into Osprey’s Fresh Catch, a piscine product known as isinglass – derived from the dried swim bladders of fish – is a traditional finings used by brewers to clarify beer. Obviously, this makes some beers inappropriate for vegetarian diets, but given its substantial haze, I doubt any of these went into Osprey’s Fresh Catch. Which is just as well, as I’m sure the Osprey would enjoy the odd fish swim bladder more than we. 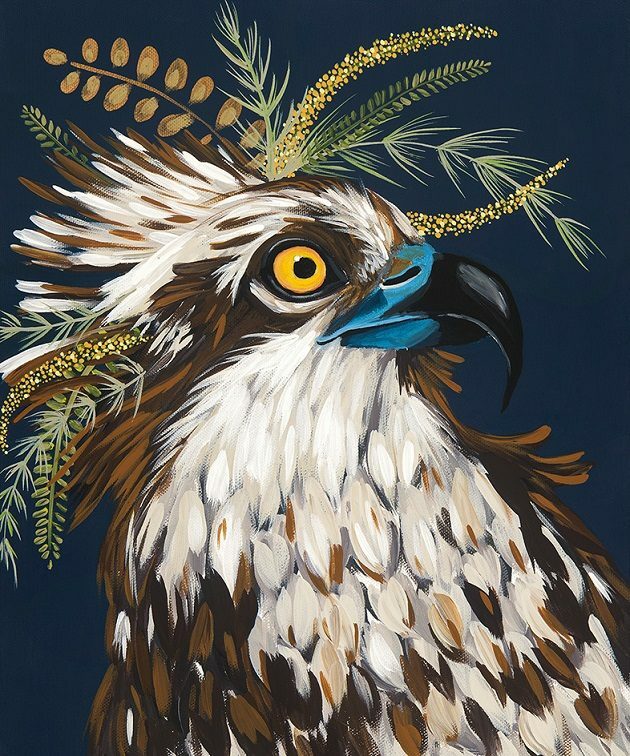 Osprey’s Fresh Catch is the first canned release featuring Whitaker’s artwork, but Horus Aged Ales is releasing other beers that feature her depictions of other birds-of-prey, including Cooper’s Hawk, Harpy Eagle, Gyrfalcon (white morph! ), Peregrine Falcon, Merlin, and American Kestrel – I look forward to reviewing these if I can get my hands on them. Fantastic artwork – and great article! Thanks so much, Tristan. Thanks, Lisa – glad you enjoyed it! It was a great beer to review. Tempted to buy this beer just for the design, love it! Well, it tastes fantastic, too! I’m hoping to get my hands on their other raptor-inspired beers.